When considering the health benefits of grapes, you might not think to include the seeds of the fruit. Grape seeds produce an oil that can be used topically or for cooking, and the oil is rich in a range of health benefits. 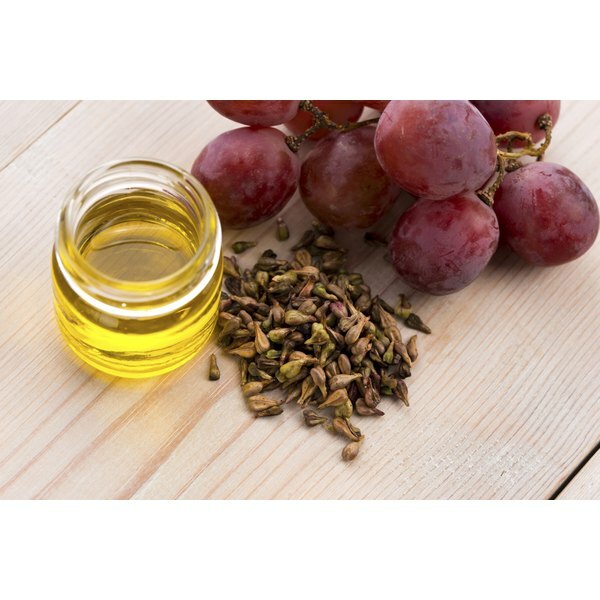 Full of antioxidants, grape seed cooking oil can be used in dressings or for cooked dishes. A review of current research published in the “Journal of the American Dietetic Association” in 2011 concluded that grape seed oil helped lower blood pressure levels as well as overall heart rate. Moreover, the oil did not affect blood lipid levels. Both animal and human studies were reviewed, and while the results are promising, researchers concluded that further long-term studies were needed. According to Drugs.com, grape seed extracts contain the antioxidant proanthocyanidin. In a study published in 2000 in the “Journal of Medicine,” the proanthocyanidin content of grape seeds helped lower the overall low-density lipoprotein levels as well as total overall cholesterol levels. In addition, the study participants who received the grape seed extract had lower oxidized LDL levels than the control group. According to the University of Maryland Medical Center, however, the evidence that grape seed extract affects cholesterol levels is inconclusive. According to a 2006 article in “Clinical Cancer Research,” an animal study conducted at the University of Colorado Health Sciences Center found that grape seed extract was helpful in inhibiting the growth, development and effects of colorectal cancer cells. Scientists concluded that grape seed extract may help inhibit colorectal cancer tumor growth without toxicity. This research is still in its early stages, however, and further study of grape seed extract as a means to prevent colorectal cancer is needed, including research on human participants. Grape seed oil is made by grinding the seeds and pressing them to release their fatty compounds. Grape seed oil has a neutral taste and so can be used as a substitute for a range of other oils, including vegetable oil, olive oil, peanut oil and butter. Despite its neutral flavor and health benefits, however, it is still a fat and should be consumed sparingly. According to ChooseMyPlate.gov, the recommended oil consumption for adults is between 6 and 7 teaspoons per day. What Is the RDA for Vitamin E?